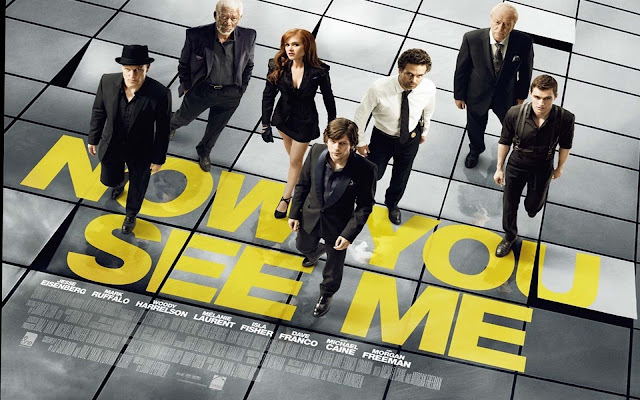 I know I'm way late on the bandwagon here but I just came from the cinema three minutes ago and I saw "Now You See Me" and loved it so much it was impossible not to write a post about it! There's another post coming tomorrow morning as well but I just couldn't wait to post this one as well! Ok, so I'm a big sucker for magic and especially mentalism so I was sucked in by the movie right away. I saw the trailer back in May but I couldn't see the movie earlier because I was caught up with my exams and then everybody else had seen it but me and I had no one to go see it with (luckily mothers can't refuse going to the cinema with their daughters). I was a bit nervous because I thought I would be disappointed; I had quite high expectations. But I wasn't. I mean, there were some parts I didn't really like... i.e. the ending, but I got over them.The cast was great: Morgan Freeman, Woody Harrelson, Jessie Eisenberg etc and the special effects just as well. I really think I could see this movie again, and I don't normally see movies twice unless I really like them. (Or if I'm obsessed I watch them thousands of times like I did with Harry Potter pt. 1 and Anastasia <<I know, I'm a dork>>). All in all, I know I left the cinema extremely excited and there are some memorable and witty scenes in the movie that made me laugh out loud. And... we couldn't tackle Now You See Me without boys talk. I know everyone is obsessed with Dave Franco and I've got to give it to you, he is one piece of a man but honestly... I've got a thing going on for Jessie Eisenberg. I don't really know why, probably because he's smart and arrogant and a complete control freak just like me. i still haven't seen that movie!!! :( i was also busy with work and school when it was shown in the cinemas! anyway, amazing pics!